ALBATROSS is a nicely observed British coming-of-age drama by debut director Nial MacCormick and writer Tamzin Rafn. It stars Felicity Jones (LIKE CRAZY) as Beth, an earnest intellectual teenage girl living in her parents seaside boarding house. Her mother (Julia Ormond) is the put-upon wife of a one-hit wonder author (Sebastian Koch). Into the mix comes Emelia (DOWNTON's Jessica Brown-Findlay), a teenage tearaway who conducts an affair with the father, and befriends the daughter, leading rather predictably to a confrontation about the implicit betrayal staged over Beth's Oxford entrance interview weekend. There's nothing massively new here, but I liked the performances, and there was something convincing about both Beth and Emelia - both girls aware that they are sexually attractive but not yet in control of it. I also liked Sebastian Koch as the wastrel father. ALBATROSS isn't a stand-out film by any means, but it is an interesting enough watch, and I look forward to MacCormick's next feature. 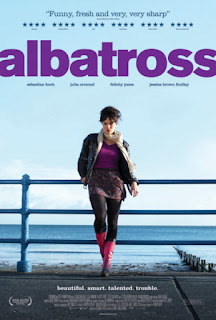 ALBATROSS opened in the UK and Ireland in 2011 and is available to rent and own.